Horizon is an Imaginary Line is an experimental light and electroacoustic installation that innovates the use of projected moving images into haze to transform the perception of space into a poetic experience of nature. 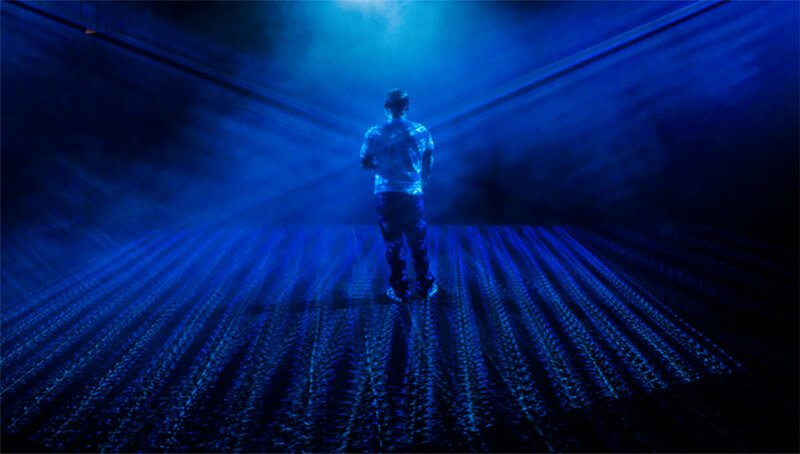 The work is installed in a completely dark space and consists of 4 rotating projectors that are programmed to project the animation throughout a space filled with haze. The projection is focused on homogeneous clouds suspended in the air. Light beams interact with steam particles, become visible and seem like they can be felt by touch. Light rays traveling from the projector lamp through the space become seemingly tangible, creating dynamic light sculptures that change depending on the condition of fog and projected animation. Video animations of abstract geometric forms are created to form an experience of light that gradually evolves into the detailed organic shapes embodying the sublimity of nature. Kinetic light sculptures are accompanied by an electroacoustic and ambisonic composition that is also made to transform the poetic experience of space and creates an ever-changing experience. Moving beams of light are simultaneously physical and ephemeral, figurative and abstract, still and dynamic. The phenomenal experience of light and sound are nearly impossible to capture as they change based on the state of the fog and the viewers position. Each visitor creates a silhouette in space that contributes to the total sensation of the piece, and thereby integrates the visitor’s presence into the aesthetic experience. As visitors move, their figures at times block haze and fog and the moving images, which provide them with an opportunity to interact with the environment and make an immediate influence on it. The play of light across the space that visitors enter also transforms the perception of bodies present in the piece. The main medium is light and the transformation of the immaterial sensation of light by projecting animation of simple geometric patterns and references to nature into a material experience of the constructed landscape. It creates light sculptures by means of re-appropriating cinematic technologies, and holds a lineage that traces back to the abstract paintings of artists like Mark Rothko and before him, J.M.W. Turner where the perception of landscape is treated as a vehicle for the numinous.